Warning: Review contains spoilers for previous installments AND Tower of Dawn. I must admit, though I love the Throne of Glass series, it took me a LONG time to start reading this. Because I’ve had some issues with some plot decisions Sarah J. Maas made and how she has treated her characters, mostly Chaol, in the previous books. So I was procrastinating to say the least. I wasn’t even all that sure if I wanted to read this, or even the last book. But after reading quite some positive reviews and my best friend pushing me to read it, I gave in and started and guess what? I actually quite enjoyed this one. Enough to fly through it in 2-3 days. And I’m looking forward to the final book again. So if you felt the same way and were maybe hesitating to pick this up, I can definitely recommend giving it a try either way. !! SPOILERS FOR TOWER OF DAWN START HERE!! – Discovering the Southern Continent. When I though we already had such a big world, and so much to discover, guess what? There is more. And the Souther Continent is every bit as intriguing as the other Continents. – The ruling family and political intrigue. I loved getting to know the khagan and his family. The princes and princesses of the Southern Continent are all so intriguing and I loved getting to know them. – Yrene. Though she may have appeared in my least favorite novella in The Assassin’s Blade, I found that I actually quite adored her character here. And I for one can’t wait to see her interact with the other characters in the final book. – How Chaol’s disability was handled and his healing process. I was worried this book would end up giving a very ableist message, but it actually handled Chaol’s healing process very nicely. It felt similar to me to Aelin’s healing process in Heir of Fire. But mostly, Chaol realized his happiness and his worth were not tied to his ability to walk. And I thought it was written and handled well. – The Chaol and Yrene romance. In my heart, I will always stay a Chaol/Celaena shipper. But I am okay with this. Chaol and Yrene fit well together, I loved seeing their relationship develop and thought it was handled realistically. – The healers and their important role to play. Though this series is filled with a ton of ladies who slay, whether they are assassins, queens, witches or shapeshifters, pure brute strength isn’t everything and I love that these healers get the spotlight and have such a huge importance to the storyline. – Ruks. Sartaq and his army of Ruk riders easily grew on me the most. Though I am just as hesitant as Nesryn to see these magnificent creatures going to war and be pitted against the witches and their wyverns. – Nesryn. She is nobody’s sidekick and I loved that she got her own adventure and meet up with her family again. – Hasar. I loved that despite the fact that the princess was a cruel, conniving and manipulative commander of the armadas, I still quite enjoyed her character and will adore seeing her interact with both Aelin and Aedion. – Falkan. Boy, everybody from The Assassin’s Blad is really coming back to play an important role, and I AM HERE FOR IT. – Important revelations. This is not just a little novel on the side. Don’t skip this book. Important discoveries are made that will change the course of the war and will have a HUGE impact on the final book. – Enough with the off-page marriages. Or even enough with the marriages. Why do you have to marry everyone off, Sarah? – Though I thought the Chaol-Yrene romance was well done, I was less convinced about the Nesryn-Sartaq romance. It felt a little forced and though I love seeing Nesryn happy, I don’t think every single character HAS to be paired off. Overall, I highly enjoyed Tower of Dawn. Though it’s not perfect, it reminded me of my love for the series, redeemed a few of my issues and got me super excited for the finale. So I couldn’t have asked for more. 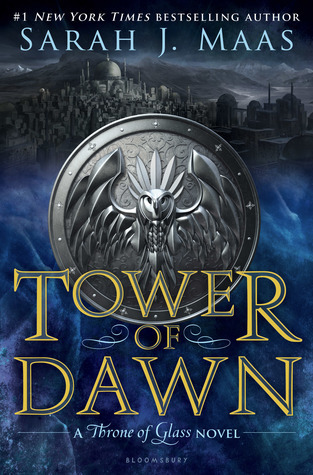 HAVE YOU READ Tower of Dawn? WHAT DID YOU THINK ABOUT IT? I was so done with Maas until I read Tower of Dawn. I refell in love with Chaol and the worldbuilding was just so good? I really hope she writes the 7th ToG novel like Tower of Dawn because it was just so refreshing and good! Also, someone needs to tell Sarah that not all of her characters need to get married and matched up. It’s ok to be single! I’m so glad you liked this too! I was so happy with Chaol becoming someone I loved again. I loved him from the first two books and I was so sad to see his character be destroyed. This made up for it. Great review! I can’t read the full review because I have only read the first three books of the series but I’m glad you liked it. I have a hard time picking the next book up although I really want to. I’m just intimidated, I guess. Ahh! I saw you had reviewed this one when the post came up on my Bloglovin and I literally gave a squeak (my quietened down version of a squeal of delight!) and couldn’t wait to get over to your blog to read ALL ABOUT your experience. Well, I’m so pleased that you enjoyed this one so much and I have to admit that I was so hesitant to read it to – not because of plot issues in this series or because I shipped Chaolena (I totally didn’t) but because ACoWAR kind of bit me and I was so worried where this one was going. Thank goodness I loved it – and I loved seeing that there had been PLANS for these people all along! I can’t wait to reread this entire series including this one ready for the next installment. It’s just so far away! In the meantime I’m going to reread ACOTAR before ACOFAS comes out and see how ACOWAR sits with me this time… Who knows, it might get better for me. Awesome review and I love your bullet points on this one! Yeah, I have the feeling ACOWAR kind of bit me too and that affected my enthusiasm for this book as well. I’m also less excited about ACOFAS than I should be, considering how ACOMAF is one of my ALL-TIME FAVES… Maybe it’s a great idea indeed to re-read and rediscover that love before ACOFAS! Hope it’ll get better for you on your re-read and I am looking forward to hearing your re-read thoughts!